Sheridan & Dulas, P.A., is a full-service law firm offering a variety of legal services involving matters of criminal law, family law, Social Security Disability, estate planning and more. 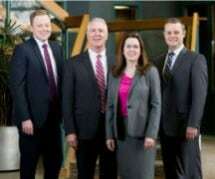 Located in Eagan, Minnesota, we represent clients statewide. Whether you are facing a DWI charge or going through a divorce or battling any other legal challenge, you will have the benefit of more than 45 years of combined experience when you entrust your legal needs to Sheridan & Dulas, P.A. While we are a general practice law firm, the attorneys of Sheridan & Dulas, P.A., strive to be experts in their respective fields. Our lawyers each have specific areas of focus — including family law, criminal law and DWI defense — allowing them to provide highly knowledgeable counsel and legal representation. We are proud to practice law with passion and integrity, and we achieved positive results for many clients as well as numerous accolades for our work. We have been listed in U.S. News & World Report-Best Lawyers among the Best Law Firms in America since 2010. Our lawyers have also been selected for inclusion in the list of Super Lawyers for several consecutive years. Whether you are in need of criminal defense representation, family law counsel or any other legal services, our partner attorneys Jeffrey Sheridan and DeAnne Dulas, and the rest of our team, would be honored to guide you to a solution. Call 651-968-1249 today to learn more about how we can be of service.